Around mid-morning on Tuesday, Nix drove Tom, Jude, and me to Cape Town in her rental car. Nix left the Oasis trip back in Victoria Falls, but she lives in Johannesburg and had flown to Cape Town so she could meet us in Stellenbosch. With our arrival in Cape Town, the total mileage for the entire 73-day Oasis trip came to 8,700 miles since we first left Nairobi back on February 15. We met back up with the Oasis truck at a hostel in Cape Town called The Backpack. 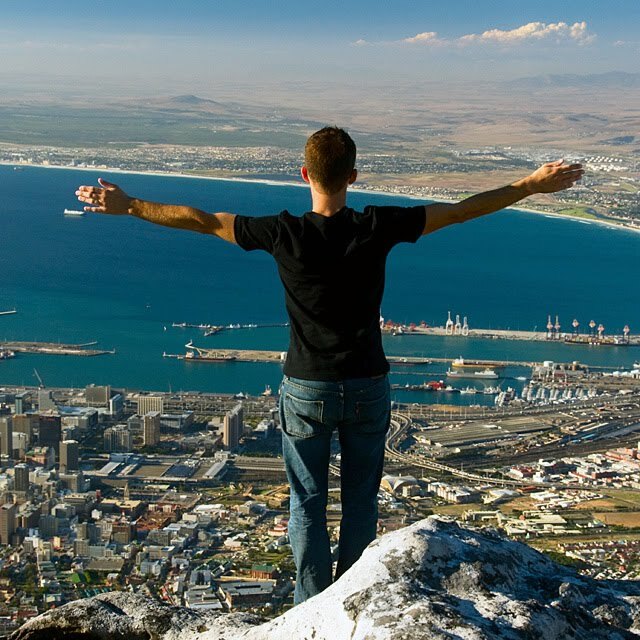 The Backpack is ranked as the best hostel in Africa according to Hostelworld.com, and it is indeed very nice. 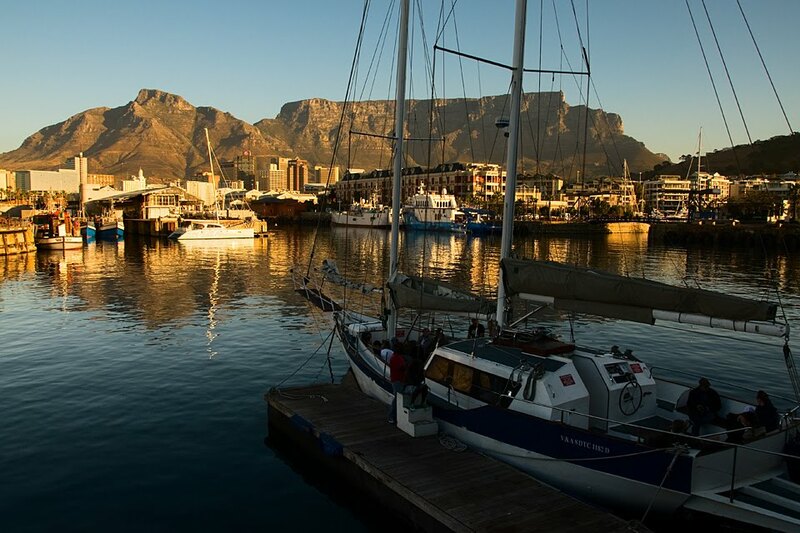 Like almost everywhere in Cape Town, it has a grand view of Table Mountain rising high above the city. There is a picturesque patio courtyard adjacent to the bar, and bulletin boards contain information about every activity you could want to do in the Cape area. After sorting our stuff out, Tom and I decided to go for a walk to get to know the city. We strolled all the way down to the V&A Waterfront, a rather touristy area packed with fantastic restaurants, luxurious shopping centers, a movie theater, and attractions such as the Two Oceans Aquarium and the gateway to Robben Island, where Nelson Mandela was imprisoned. 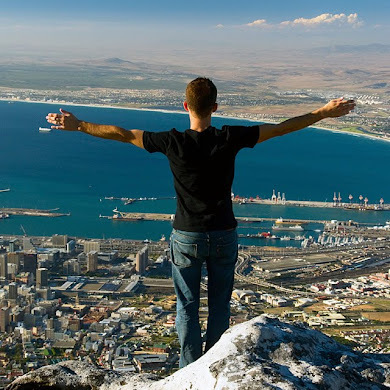 It felt great to be finished with camping for a while, and I used the opportunity to recharge – I went to a salon for a haircut, bought some new clothes, and enjoyed the majestic view of the Cape Town skyline nestled up against Table Mountain. 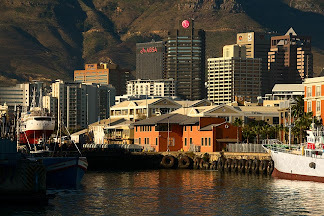 Seen from the V&A Waterfront, the skyline of Cape Town, South Africa is dwarfed by Table Mountain. Back at the hostel, we met up with some more people and went out to dinner at an amazing Asian restaurant, where I devoured a scrumptious sushi feast. Afterward, only one other guy, Ben, was up for seeing a movie, so we walked to find a nearby theater. The one a few blocks away was closed, so the only option was to go down to the huge theater at the waterfront. We started walking, cautious of Cape Town's notorious crime rate, but soon hopped in a cab when things began to look too dark and dodgy. We arrived just as the movie was beginning – we saw Clash of the Titans, and it was probably the worst movie I've ever seen. After the movie, we took a cab back to the hostel, and I crashed in a nice, soft bed. 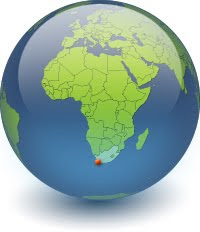 Yesterday, Nix and I set out to look for a bakery in Cape Town while Tom took Jude skydiving north of Cape Town. Today is Jude's birthday, and the three of us wanted to get her a custom birthday cake. We found a cute place called Charly's Bakery that makes some of the most attractive cakes I've ever seen. After ordering the cake, Nix and I drove to Bloubergstrand on the coast north of Cape Town. We met up with Tom and Jude at a seafood restaurant called The Blowfish after they were done with their skydive. The place sat next to the beach and was filled with light from large picture windows. 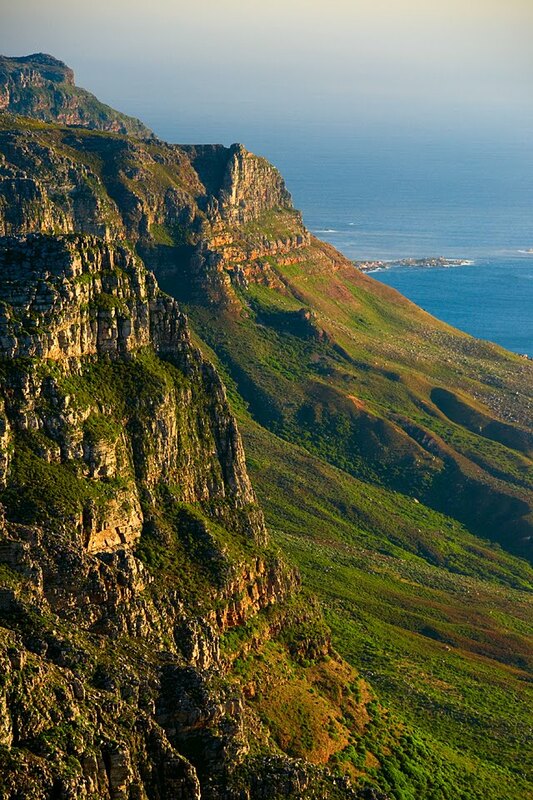 There was a stunning view across Table Bay to Table Mountain and Cape Town. The menu offered smoked crocodile sushi, so I had to give it a try. 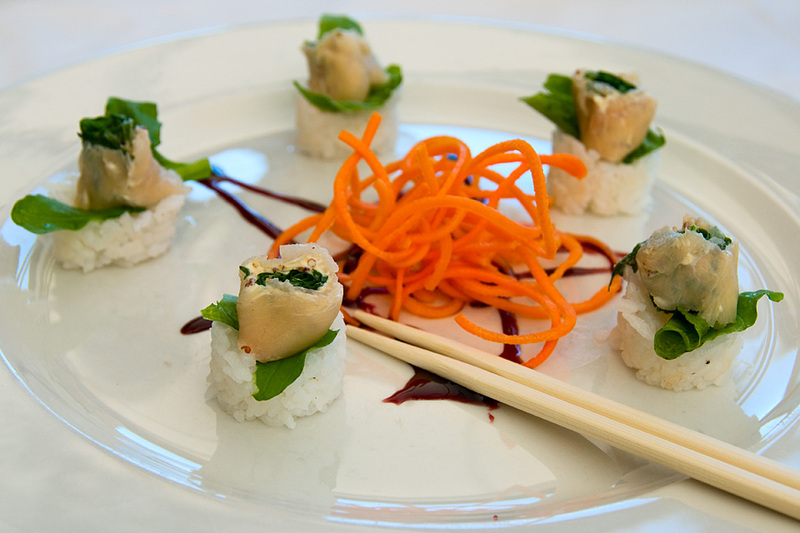 The Blowfish contributed to the abundance of world-class food we have enjoyed in Cape Town so far. 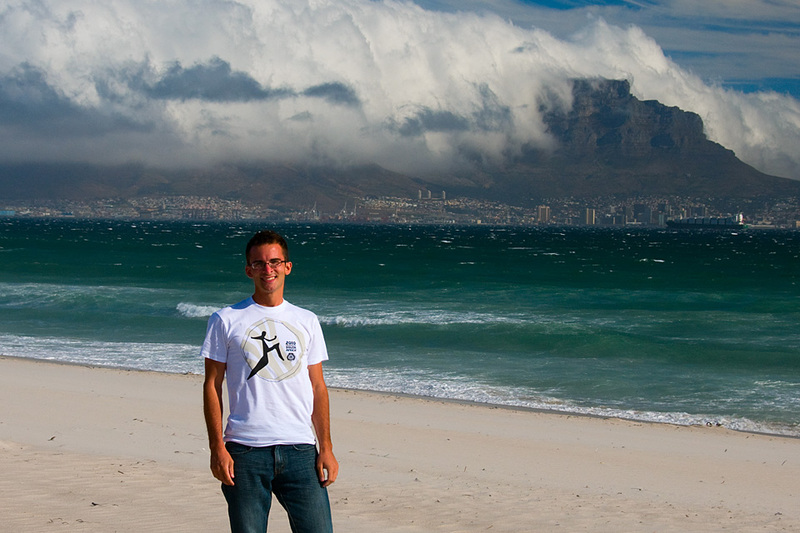 Seen from the beach at Bloubergstrand, Table Mountain looms over Cape Town, South Africa. 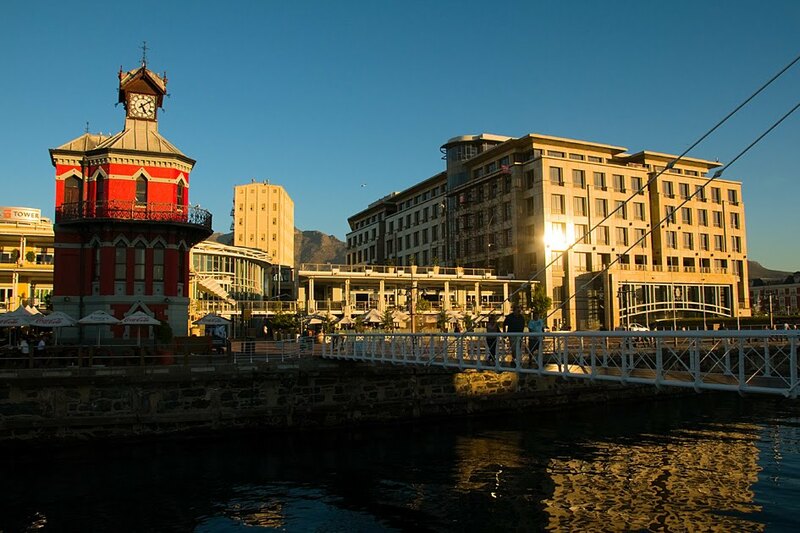 Yesterday evening, a group of us walked from the hostel to nearby Long Street, the major center for the fantastic nightlife of Cape Town. We went to a few bars, one of which had free drinks from eleven to midnight. At midnight, we sang Happy Birthday to Jude and then piled in some cabs to a club near the waterfront. After a short night's sleep, we got up this morning to finish preparations for Jude's birthday. Tom took her shopping while Nix and I picked up the cake from Charly's Bakery. We barely had enough time to decorate the courtyard at The Backpack with balloons and party paraphernalia before Tom walked in the gate with Jude. She was thrilled with the custom cake – it looked wonderful and tasted even better! This afternoon, a small group of us took the aerial cableway to the top of Table Mountain. The cable cars are circular, and the floors rotate 360 degrees during the ascent up the sheer cliffs, creating a disorienting feeling. From the top, the view of the whole of Cape Town is awe-inspiring. On the opposite edge of the mountain, the imposing coastal cliffs stretch south towards the Cape of Good Hope. Rock hyraxes, known here as dassies, lounged like sentinels on the rocky cliffs jutting out towards the ocean. As the sun set over the vast waters of the Atlantic, the buildings in Cape Town glowed pink and orange. As darkness fell, the millions of city lights twinkled in the crisp air. 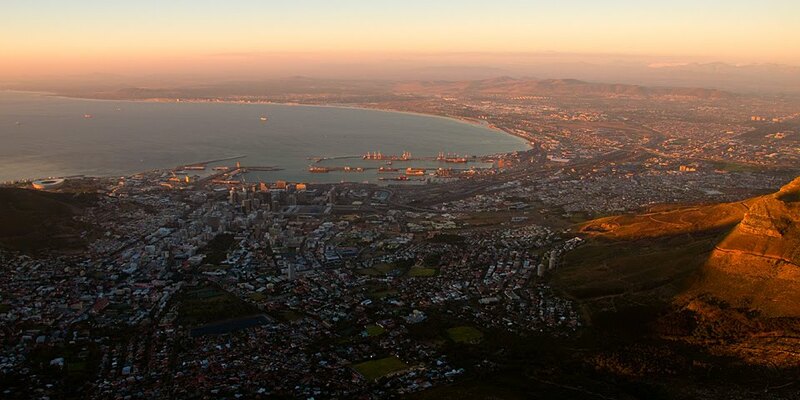 Seen from Table Mountain, the city of Cape Town, South Africa glows at sunset. Seen from Table Mountain, the city lights of Cape Town, South Africa illuminate the night.